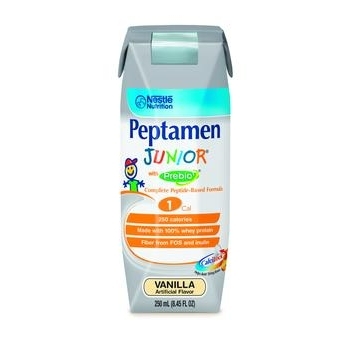 Nestle Peptamen Junior® w/Prebio 1™ is a complete peptide-based formula with Prebio1TM soluble fiber for the nutritional management of Children ages 1-13 with impaired GI function. Nestle Peptamen Junior® w/Prebio 1™ is a complete peptide-based formula with Prebio1TM soluble fiber for the nutritional management of Children ages 1-13 with impaired GI function. Contains enzymatically hydrolyzed, 100 % whey protein to facilitate gastric emptying. Contains CalciLock™ blend of essential nutrients, including calcium and Vitamin D, to support healthy bone development.